Are you a die-hard NFL fanatic? For sure, just as how much you loved the real game that’s going on in the huge field, you will surely get glued to NFL Blitz. Every football lover must love it. The famous NFL Blitz game is now upgraded. What you will love about the newly upgraded and released NFL Blitz is that this is action packed. This game can be obtained for Xbox Live and PlayStation Network. You will surely love this game even more if you have enjoyed the previous NFL Blitz versions. The new features of the NFL Blitz will definitely excite the many football game lovers. The clock stops after each play and every quarter has two minutes and this means that you will have a longer play time. Also, you will be able to enjoy the Blitz Gauntlet. You will have the chance to fight with the different NFL teams out there in the Blitz Coliseum. Moreover, if you love to play online then you can go for the Blitz Battle. You can even make yourself a name through the ranking feature on the National battle board and be part of the Blitz Hall of Fame. However, a disappointing thing that has happened with the newest version of the game is the omission of the late hits. The newest version of the NFL Blitz doesn’t include the late hits in the game. But, you will still enjoy the rest of the game-play as it features pure Blitz. You will be able to play with the excellent players in all of the 31 NFL stadiums. Also, you will get more excited with Blitz store which is also a new feature. If you choose to play online, then you will be able to get Blitz Bucks. These Blitz Bucks can be used for buying items in the Blitz store so that you can make customizations of your Blitz Elite team and also your Blitz Battle team. You may get banners and logos and make 50+ upgrades, power ups as well as visual enhancements. 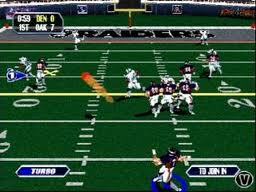 If you have loved football and gaming all your life then the NFL Blitz is the kind of game for you. You may play with your circle of friends and go for a head to head competition. If you want, then you can go online and compete with different opponents playing from other parts of the world. Playing with your friends and going online offers just the same excitement and fun and you will be enjoying this game for hours. For any football fanatic, this game is a must. The new NFL Blitz is available for Xbox Live and PlayStation Network and the cost of this game is only $14.99. You will have lots of action for such an affordable cost. Surely, you and your friends will enjoy more bonding hours through this game. Get the new NFL Blitz, take hold of the controls and have fun playing football! The author is a freelance writer who writes about fax services on-line. He also does fax comparisons. This entry was posted in Football and tagged blitz game, gaming, NFL, nfl blitz, nfl football, nfl stadiums, playstation network, sports, xbox, xbox live. Bookmark the permalink.